Origination Point is a generative sound responsive projection installation originally exhibited at the 12th Havana Biennial in Havana, Cuba as part of the collective exhibit Entre, Dentro, Fuera/Between, Inside, Outside and at The Harwood Museum, Taos, New Mexico. Special thanks to UNM College of Fine Art for making possible a special course that allowed graduate students to participate as assistants for the Havana Biennial 2015.: Abbey Hepner, Christine Posner, Julianne Aguilar, Adrian Pijoan. 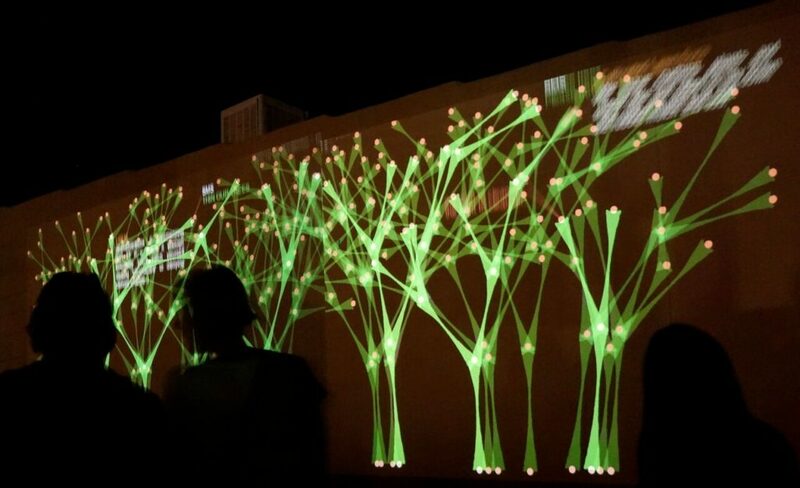 (x)trees is projected in real time on to buildings and large spaces, exploring messaging and mobile devices as a way to create a participatory experience around the theme of protecting our natural resources, and our relationship to communication technology. By integrating data mining from social networks and text messaging, people participate in the creation of the branches to create a virtual interactive forest of dynamically generating trees. The audience sends a tweet or text message and sees their message appear on the wall with a branch. The key word is chosen in relation to the event i.e. climate change.